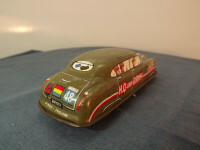 This model is the Dibro 4 Door Sedan Car in Olive army livery. 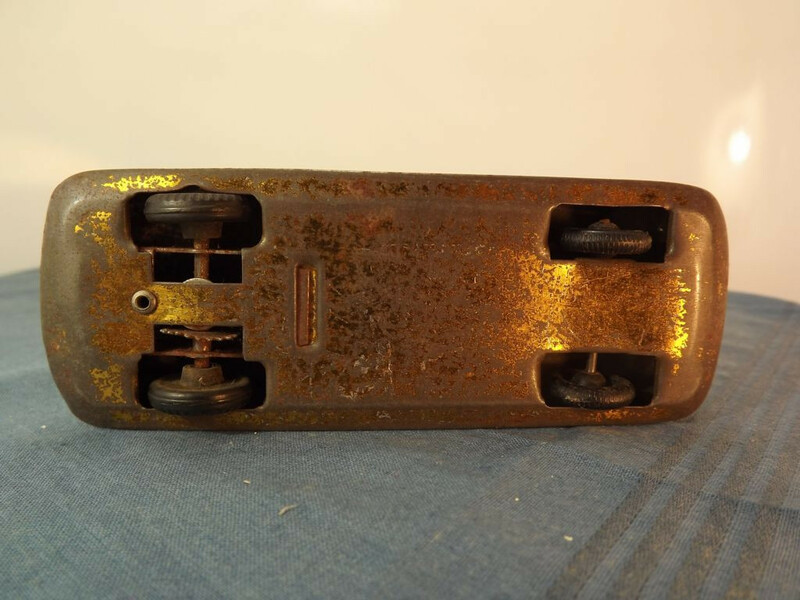 The item is tinplate and with friction drive. The model has a one-piece, pressed metal body, 112mm in length. It has been shaped with rudimentary representations of the body lines. There is no glazing - all the features are lithographed onto the body. At the front are representations of the windows, head lights, parking lights and grille, and printed numberplate – white lettering on a black background [36RG13]. 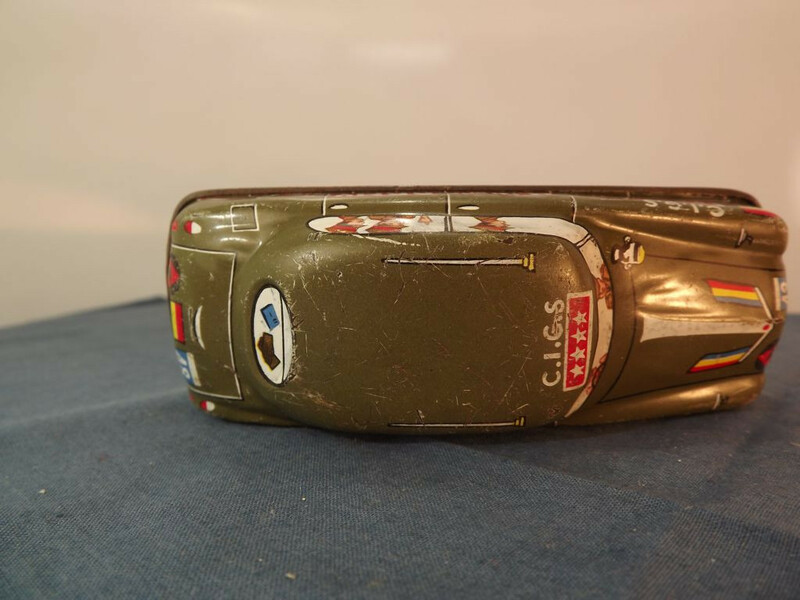 The bonnet carries a lithographed bonnet emblem, various military insignia, and left hand spotlight or siren. To the sides there are outlines of the doors with door handles, outlines of the wheel arch covers, and the body trim. The front top of the wheel guards have representations of wing mirrors and the sides of the wheel guards carry a red,yellow and blue insignia and "C.I.G.S." over a red panel with 4 white stars. The side doors have been lithographed with "H.Q. GRP Army" and carry a red and white lithographed body trim line. In each of the windows, front, rear and side, there are profiles of the driver and three passengers. The roof is also olive with a pair of lithographed aerials and the white "C.I.G.S." lettering over a red panel with 4 white stars. 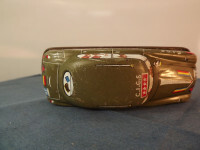 The rear carries a lithographed boot lid outline, rear lights, three insignia as on the front, and below the boot outline is a black numberplate with white lettering reading "36RG13". Below this the words "Dibro England" are lithographed in white, just above the bumper line. All of the original four wheels are present. The front wheels are possibly plastic as they have a harder feel to them. The rear black rubber wheels are attached to a steel axle that runs through a friction drive motor. The friction drive still works. 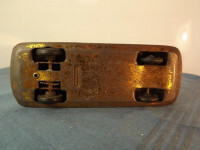 The baseplate is a single piece, shaped, pressed tin unit. It has been press fitted to the body and the edges rolled to hold it over the edges of the body. It appears to be plated or painted a goldish colour. 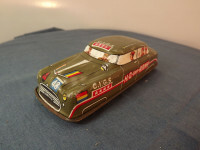 There are no manufacturer's marks or country of origin details on the base. I do not know exactly when this item was issued but believe it to be between 1945 and 1953.